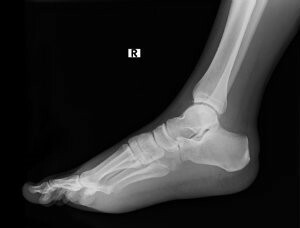 Diagnosing and Treating a Stress Fracture in the Foot Do you have pain when you walk or stand? You may have a stress fracture. Learn about the different types and treatments of stress fractures here in this video. Picture a bookshelf with a large crack in the middle, so the whole shelf sags under the weight of its books. Trying to add more books will only make the crack bigger and the shelf weaker, almost guaranteeing it will break. Not disturbing the shelf may leave it intact for a while, but eventually the constant strain will weaken it enough that it might snap anyway. The same thing is true for stress fractures in your feet. The bones in your feet absorb pressure and support a lot of weight. Normally they do this quite well, and they are able to distribute the stress evenly. Eventually, strain and overuse can damage them, however, allowing cracks to develop in the hard tissue. Usually this happens when you start a new sport or hobby that your feet aren’t conditioned for, or you overwork your lower limbs in some way. Repetitive impacts and shocks then take their toll, creating small splits in the tissue. These are stress fractures. They are thin fissures that don’t cut all the way through the bone, but they do weaken the bone enough to cause significant problems. Typically the discomfort starts out small and gradually increases with activity. Usually a specific area swells and feels tender to the touch. After a while, normal hard-impact activities may be too painful for you. It’s much better for your lower limbs to prevent a stress fracture than to live with one. Wearing the right shoes that support your feet are an important part of this. The wrong shoes can contribute to biomechanical issues that overwork the feet—or, in the case of high heels, put abnormal amounts of force on certain areas of your lower limbs. Make sure you condition your feet for your activities, too. If you’re starting a new exercise routine, or increasing the intensity of your training, slowly build up to where you’d like to be. Warm up and cool down thoroughly. Cross-train as well to reduce the stress on your bones. Sometimes, despite your best efforts, you develop stress fractures anyway. These conditions need to be treated early on to prevent them from getting worse. An untreated stress fracture has a high risk of becoming a full break, which is both more painful and more difficult to heal. Fortunately, with the right care, you can restore cracks to full health without needing surgery. Our podiatry team at Martin Foot and Ankle will carefully examine your lower limbs and use tests to check for splits. Once we diagnose the issue, we can help treat the problem. You’ll need to rest your foot and take a break from all hard-impact activities. This gives it time to heal. You’ll need to minimize pressure on the injured bone, too. In some cases, this will simply mean wearing supportive shoes with stiff soles. You might need to wear a special boot or a walking cast, however. If the pain is severe or the crack is big, you might need to remove all weight from your lower limb. Ice the painful spot to alleviate swelling and inflammation there. We might recommend pain medications for you as well. Once your bone has healed, you can slowly return to your activities, conditioning your foot to handle them. Don’t think stress fractures aren’t serious because they aren’t as severe as a full break. They are painful and increase your risk for worse problems—and they won’t get better on their own. Let Martin Foot and Ankle help. Call (717) 757-3537 to contact our podiatry offices in Hanover, York, Lititz and Lancaster today. You can also use the website to reach us.